After an exciting and fun-filled school holidays, now that the kids are back to school, things are back to normal. My 2 boys and I are trying to adapt to the new set of routines. Although they are now in the same school, they are attending different sessions. They don't get to see each other until dinner time. They have been complaining that they didn't get a chance to play together much. Poor me, I have to double up as their playmates during their individual free time. Which means I have little time to pursue my own interest :( On the other hand, I do like this kind of "1 to 1" arrangement as I can devote my full attention on just one child at a time. The following day, I set off to make this same bread again. This time, I tried kneading by hand...it was 6.45am in the morning when I started preparing the ingredients. My little one woke up early and offered his help...but he got bored halfway and went off to play on his own! By the time I finished kneading, it was almost 7.30am. When the dough doubled in size an hour later, I started shaping it. I rolled the dough to a huge rectangle, as big as I could get. 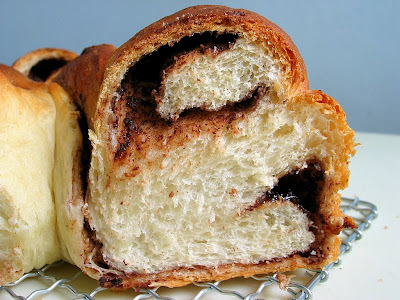 Then cut into half, lengthwise, and spread Nutella over the two doughs before rolling each dough lengthwise, swiss-roll style. The two longish rolls were then twisted together. While I was doing the twisting, my younger boy came over and asked me whether I was making ramen?! The twisted dough was then placed in a lightly greased round cake pan and left to proof. It's apparent that I didn't make enough twist and turns, as a result, the curls and swirls look horrendous! I didn't achieve the nice crown effect at all and the end result was an ugly loaf of bread, lolz! I have adapted the same milk loaf recipe to make it easier to measure out the ingredients. Fortunately, the adjustment didn't seems to affect the texture of the bread. The bread was as soft and light despite its not too pleasing exterior. Place caster sugar, salt, bread flour and yeast into a mixing bowl. Mix the ingredients with hand. Make a well in the centre of the flour mixture. Pour the lightly beaten egg and milk into the well. Mix the ingredients to form a soft dough. Add some bread flour if the mixture is too wet. Turn out the dough onto a lightly floured work surface. Knead for about 5 mins until the dough becomes smooth and non-sticky. Knead and mix in the butter into the dough. Continue to knead dough for another 15mins (or longer) until it becomes smooth, elastic and no longer sticks to hand and work surface. Smooth the dough into a round ball. Let it rise in room temperature in a mixing bowl, covered with cling wrap. Let dough rise for 60mins or until it double in bulk. Remove dough and punch out the gas. Turn the dough onto a lightly floured work surface. With a rolling pin, roll out the dough into a huge rectangle. 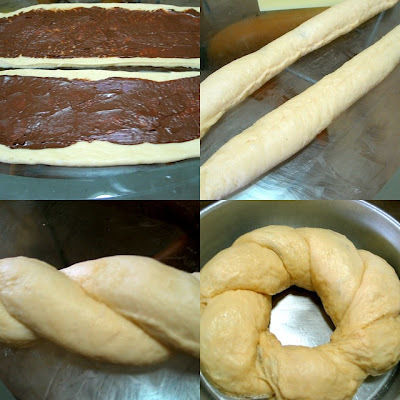 Cut the dough into half, lengthwise, and spread Nutella over each piece of dough, leaving a border of about 1cm along the edges. Roll each dough lengthwise, swiss-roll style, pinch the dough to seal the seam tightly. Place the two rolls together and twist them together. Loop the rope in a lightly greased 20cm (8in) round pan and press the ends together to seal. Cover with cling wrap and let the dough proof for the second time for about 45~60 mins. Bake at pre-heated oven at 180 ~ 190 deg C for 30 to 35mins. Unmould the bread immediately when removed from the oven. Let cool completely before slicing. I think it is not "not pleasing exterior". Looks nice and looks like home made rustic bread! That bread look so beautiful! And one just can't go wrong with Nutella. It's beautiful! 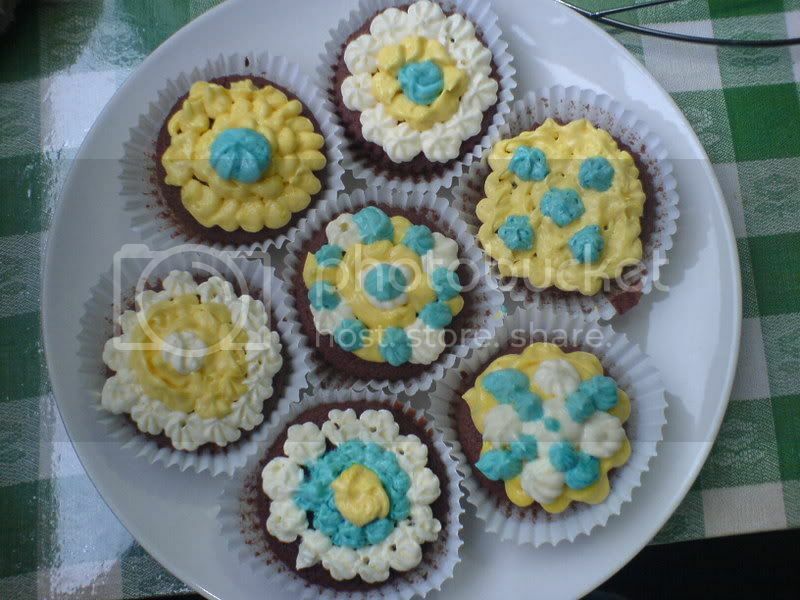 I wish my mum was still baking :">.. She doesn't anymore.. so I'm learning how to do it myself now :-). I tried your sweet bun recipe and made chasiu chaan bau..it's awesome :D! Looks good to me!! :) I just made mini nutella bread too. I really think it looks great, not ugly at all. I would surely buy it if I see this in a bakery. :P How come the bread machine can't do the job? You have any idea? I think that bread looks beautiful, and I, for one, would love a slice or 3! Hi! I have recently tried baking this and it was disastrous too! The dough was too thin and the chocolate filling I used, burst through and made a mess on my pan! Jeannie, I'm sorry to hear about the unsuccessful attempt. Maybe you have rolled out the dough too thin? Hope you have better luck with other recipes. 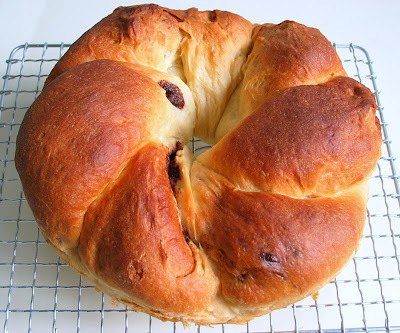 Hi HHB, I have tried to baked this bread, even the amt of yeast balance only 1/2 teaspoon, I keep to proof overnight, it's awesome and it can't go wrong with nutella as filling, thank you for sharing.